The General Henry Knox Museum is dedicated to celebrating and preserving the memory of Major General Henry Knox, chief of artillery during the American Revolution and George Washington’s first Secretary of War. Housed primarily in Montpelier, an elegant reconstruction of the nineteen room mansion Knox built as a retirement home in Thomaston, the museum offers guided tours, programs, and classroom materials that educate about Knox and his life and times. Each summer the museum offers a two-week summer teacher institute free of charge to history educators, encouraged and advised by Pulitzer Prize-winning author David McCullough, a frequent presenter. 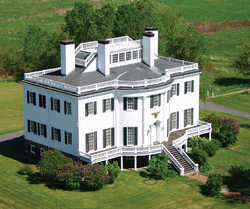 The General Henry Knox Museum is located at the corner of Routes 1 and 131 S in Thomaston, Maine.